This story is from the Occupied News Wire. It was originally published in the Occupied Wall Street Journal. by Allison Brown, Udi Pladott and Maia Ramnath for the OWS Global Justice Working Group. One of the biggest clues to understanding the connections among grassroots democratic uprisings across the world may be found by tracking connections among methods of repression. We know that tear gas canisters, stun grenades and other so-called non-lethal crowd control technologies manufactured by U.S. companies have been used not only against the Occupy movements in the United States, but also by peaceful pro-democracy mobilizations in Egypt, Bahrain, Palestine, Yemen and Tunisia, among many others. Corporations are reaping profit here and abroad from the repression of democracy. We also know that the U.S. government knows about—and even promotes—these sales. It is clear that there is deep collusion and moral complicity between government policy and corporate profit. What’s not so clear are the mechanisms by which this actually works. The relationship is convoluted, and this is no accident. Much effort is made to keep the process opaque by limiting our access to detailed information. Below, we have focused on the use of tear gas in the Middle East. We should note, however, that this is only one example of a much bigger phenomenon and a much longer history. It is emblematic of a pattern of militarized policing, corporate profiteering and governmental collusion that has been on the rise since at least the 1980s. Here is an overview of some of the main tear gas manufacturers whose products have been documented in recent protest zones. Defense Technology is headquartered in Casper, Wyoming. Along with U.S. company Federal Laboratories, with which it shares a product line, it is linked to the U.K. arms giant BAE Systems through BAE’s ownership of U.S. arms company Armor Holdings. Defense Technology and Federal Laboratories tear gas has been used in Oakland, Palestine, Egypt, Bahrain, Tunisia and Yemen. The Yemeni government regularly uses Defense Technology and Federal Laboratories tear gas against pro-democracy protesters, who have been demonstrating since February. 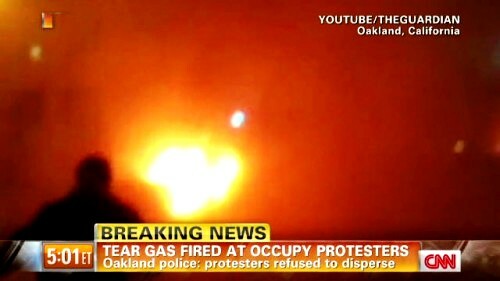 On October 25, 2011, police used massive amounts of Defense Technology product against Occupy Oakland. Iraq Veterans Against the War member Scott Olsen was critically injured when police fired tear gas at close range, hitting him in the head. The police also fired tear gas directly onto the people who came to Olsen’s aid. 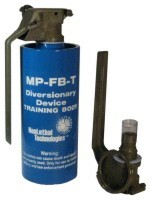 Defense Technology also provides tear gas to the Israeli police, and its canisters have been found in East Jerusalem. Previously, Federal Laboratories provided tear gas to the Israeli—this deal was the subject of protests and lawsuits during the first intifada. Based in Homer City, Pennsylvania, NonLethal Technologies is the primary provider of tear gas to the government of Bahrain, a country which has just marked the first anniversary of its peaceful mass protests. Today, protests continue almost daily despite protesters having been jailed, tortured, killed, maligned, fired from work and expelled from school, according to Bahraini activist Fahud Desmukh (aka Chan’ad, in Jadaliyya, December 9, 2011). In Sitra last August, fourteen-year-old Ali al-Shiekh was killed when police fired a tear gas canister at close range into the back of his neck. He died almost instantly. 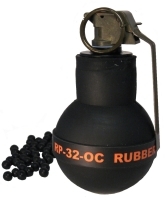 Nicholas Kristof of the New York Times observed that NonLethal Technologies canisters were regularly littered across the ground after pro-democacy demonstrations there. CSI is the primary supplier of tear gas to the Israeli military as well as a provider to Israel’s police (and border police) for use in occupied Palestine. (CSI even used to fly the Israeli flag at its Jamestown headquarters, but in advance of the Martin Luther King Day protest there, the company replaced it with a Pennsylvania state flag.) 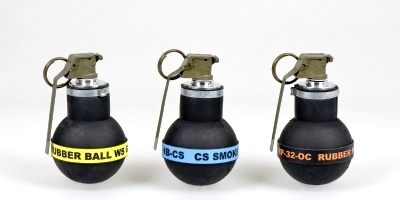 There is extensive written documentation of CSI sales and shipments to Israel; moreover CTS-brand canisters are ubiquitous at Palestinian protests, including the regularly recurrent nonviolent demonstrations at Bil’in, Ni’lin and Nabi Saleh. Palestinian protesters recently killed by tear gas include Mustafa Tamimi, from the small village Nabi Saleh, on December 9, 2011. An Israeli soldier inside an armored jeep fired a tear gas canister at close range directly into his face. Jawaher Abu Rahma of Bil’in suffocated on tear gas at a protest in January of last year. His brother, Bassem Abu Rahma, died in April 2009 when an Israeli soldier fired a tear gas canister directly into his chest. Photos and news reports have shown that CSI is a major tear gas provider for the Tunisian military. A Tunisian protester and a photographer from France were recently killed by impacts from tear gas canisters fired at close range. The company’s tear gas is the primary one used by the Egyptian security forces in its attempt to crush demonstrations there, which still continue. Amnesty International documented three shipments of tear gas from CSI (in the U.S.) to Egypt in 2011 that were approved by the U.S. State Department, despite the Egyptian security forces’ record of using of tear gas to kill and injure protesters. In the months following Mubarak’s ouster, Human Rights Watch also reported excessive use of force against peaceful demonstrations, including illegally shooting tear gas into the crowd at shoulder height, on February 25, March 9, April 9, June 28 and 29, August 1 and October 9. In the November protests around the election, tear gas was fired repeatedly—often into enclosed spaces, including into field hospitals. And again, canisters were fired directly at protesters. Egyptian human rights groups have reported that between November 19 and November 23, at least 40 protesters were killed and more than 2,000 injured. At least four people died from tear gas asphyxiation. 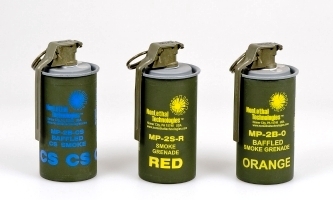 How does tear gas get from American manufacturers to various governments overseas? You could see it as a sort of triangular relationship between the U.S. government, U.S. corporations, and other governments. These three points are always involved. The fungible path of money and weaponry follows various routes and takes different forms at different points in the process. One thing to emphasize here is the complicity between state and corporate interests: government policies actively work in war profiteers’ favor. Even when it’s a commercial sale, tear gas (like any other weapon) is subject to export controls, so U.S.-made tear gas cannot be shipped abroad without government approval. Here are some of the ways by which tear gas moves from manufacturers to clients in different countries. The U.S. government’s role usually consists of one or more of the following: authorizing a sale, arranging a sale, subsidizing it, or funding it directly with taxpayer money. These are government-to-government transactions, administered by the Defense Security Cooperation Agency in the Pentagon. FMS requests are initiated by the purchasing country, and handled initially by the U.S. embassy in the client country. The Pentagon handles the entire transaction, but the State Department can also approve, reject or halt any purchase. The military articles sold through this program can come from either Pentagon stocks or new production. In the latter case, the Defense Department contracts with U.S. arms manufacturers to actually build the weapons and, in some cases, provide related services. But the Pentagon takes care of all of the paperwork. The top three buyers in FMS for fiscal year 2010 were Egypt ($2.45 billion); Israel ($3.95 billion); and Kuwait ($1.6 billion). The top DCS totals for fiscal 2009: Egypt ($458,000 for tear gas and other riot control agents, $101 million total); Israel ($1.05 million for tear gas and other riot control agents, $602.6 million total); and Kuwait ($1.24 million for tear gas and other riot control agents, $923 million total). The U.S. government does more than just approve sales. American taxpayers directly finance foreign governments’ purchases of U.S. military products via “military aid”—essentially grants and loans to foreign governments for arms purchases. In most cases, financing is available only for the sale of U.S.-made products. So, in effect, these are taxpayer-financed subsidies of private weapons manufacturers and defense contractors. In some exceptions, such as those made for Israel, a recipient country can use the a limited portion of the aid to fund purchases of its own domestic products. Foreign military financing is regularly applied to FMS purchases and is relatively well documented. But because transparency is lacking when it comes to DCS purchases, it’s harder to accurately associate FMF funds with these purchases. How much of this applies to the militarized policing technologies, including tear gas, that are being used to suppress democratic movements? In other words, how much of our tax money is actually contributing to the use of tear gas by foreign governments against those with whom we feel affinity? That’s not easy to break down. But regardless of whether particular tear gas purchases are directly funded by taxpayer money, FMF contributes to the client countries’ military budgets, so even if it only funds fighter jets and tanks, it still frees up funds for them to purchase other weapons, including tear gas. On November 26, seven tons of CSI munitions arrived in Suez—the first of a three-part shipment, totaling 21 tons. Customs officials at the Adabiya port of Suez tried to prevent entry by refusing to complete paperwork. This year, on Valentine’s Day, hackers associated with Anonymous claimed to have broken into CSI’s online systems and stolen personal information belonging to CSI employees and its clients. In a statement posted while the company’s website was down, Anonymous cited CSI’s sale of “mad chemical weapons to militaries and cop shops around the world,” and referenced the ongoing sale of tear gas and other weapons to Egypt during the repression of protest. So what can we do here to support our comrades in Egypt, Bahrain, Palestine and elsewhere? 1. Contact the Ad Hoc Coalition to Defend the Egyptian Revolution, Witness Bahrain, and Adalah-NY to see what they’re up to and how you can get involved. Around the world, people are standing up for social and economic justice and political freedom. Meanwhile, those parties who are benefiting from the repression of protest are more or less the same ones who benefited from the conditions that sparked the protest in the first place. Quite simply, what the 99% want is diametrically opposed to the interests of the global military-industrial regime, both here and abroad. People-to-people solidarity will bring down and change that regime. And it’s within our power to do so.